Farmers on the western side of the San Joaquin Valley can count on two things: sunshine and water that's polluted and salty where minerals have built up in the soil. Now a Northern California entrepreneur is using one to clean up the other in the Panoche Water and Drainage District near the little town of Firebaugh, about 50 miles northwest of Fresno. It’s called a "drainage district" because farms around here have to get rid of excess salty irrigation water, explains ranch manager Wayne Western (yes, that’s his name). An elaborate system of underground drains and pumps collects the runoff. The district then recycles that water on 6,000 acres of more salt-tolerant crops. “These are pistachios right here, they’re 13 years old,” he says, walking through an orchard that’s getting some of the reclaimed water. The residual water is laden with salts and other contaminants such as selenium, which is toxic in high concentrations. The district reuses this water not only on pistachios, he says, but also on another salt-tolerant crop, Jose tall wheatgrass. The revenue comes from selling the wheatgrass, which is used for cattle feed, and the pistachios. As it turns out, cattle need a certain amount of selenium. But there’s still the problem of the brackish runoff from these salt-tolerant crops. By 2016, environmental regulations will put a stop to dumping it into the San Joaquin River. Falaschi says finding another solution is paramount, if tricky. “Over the course of the last 15 years, we must have tried out 20-to-25 different treatment processes and you know, you end up spending a lot of time and a lot of hours on something that just doesn’t work,” he says. But now there’s one idea that’s starting to look a little brighter. Falaschi points to a row of curved mirrors that stretch out near a field of wheatgrass. It’s an experimental solar desalination plant, funded by the district with a million-dollar state grant. The project looks a bit like a spaceship on this vast expanse of land. “If we can treat this water, we’ve managed our drainage problem, but we’ve also created supplemental water,” says Falaschi. “That’s why we’re excited." An absorption pump that Mandell and his team designed reduces by half the energy it takes to evaporate water. 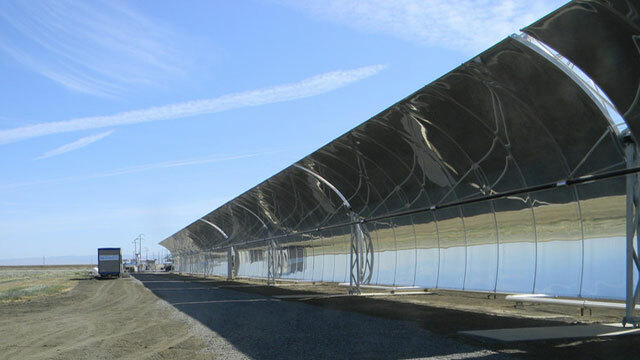 The project also uses a reflective mirror-like film to focus the sun on long tubes containing mineral oil. The heat from the oil is piped into evaporators to generate steam. “So the heat that we generate from the sun basically separates water and salt,” he says. The process produces potable water which the company can then sell, along with some of the minerals distilled out, like selenium and even boron. The project is timely with California three years into a drought, but Mandell says, that wasn't his motivation. WaterFX will soon build a much larger plant, this one funded by investors. It’s slated to treat about 2 million gallons a day. Mandell says it will cost about $450 to produce an acre-foot of water. That's more than farmers here pay for surface water but about half the total operating costs of a conventional desalination plant that uses reverse osmosis. Dennis Falaschi says his water district will provide the 75-acre site and probably be the main customer. Farmers this year received no water from the federal Central Valley Project, so the onus, he says, is on Water FX. Alice Daniel reports out of The California Report's Central Valley bureau.